From left: Philippine Dealing & Exchange Corp. President & COO Antonino A. Nakpil, AB Capital and Investment Corp. President Senen Matoto, Phoenix Petroleum Philippines, Inc. (PNX) Chief Financial Officer Joseph John L. Ong, PNX President & CEO Dennis A. Uy, PDS Group President & CEO Cesar B. Crisol, Multinational Investment Bancorporation President Marilou Cristobal, Martinez Vergara Gonzalez & Serrano Partner Elmer Serrano. 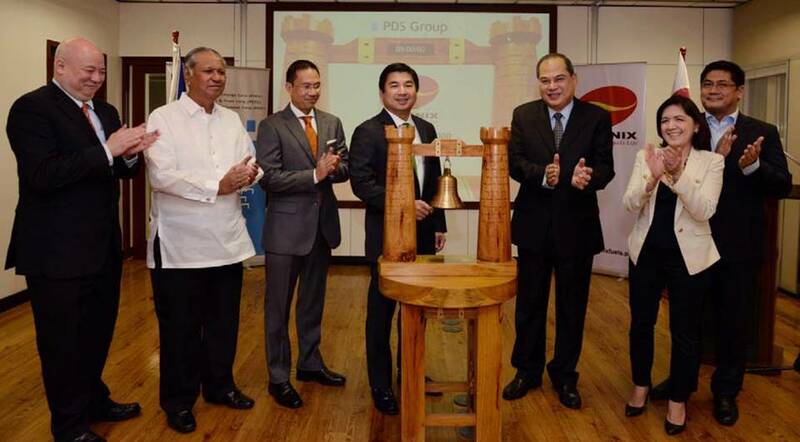 10 November 2014, Makati Philippines – The Philippine debt market celebrated two landmark events: the debut and maiden issuance in the organized secondary debt market of an independent oil company, Phoenix Petroleum Philippines Inc., and the first ever listing of a Short-Term Commercial Paper (STCP) – a security that hasn’t been offered to the public in more than a decade. Phoenix Petroleum is the first oil company to join the PDEx Issuer community. Driven by its mantra of passion and compassion, Phoenix Petroleum has established its position as the country’s fourth largest and fastest growing independent oil company. And this remarkable performance of Phoenix has extended to the investing public as reflected in the over subscription of the PNX STCPs due 2015 of almost two times. The inclusion of STCPs alongside Bonds in the organized secondary market will afford corporate issuers flexibility to access short or long-term funding supported by the same established secondary market infrastructure. For investors, the program shall also provide price transparency and liquidity for these instruments as alternative fixed-income investment options. “We commend PNX’s vision: passion to be indispensable and compassion to care for the company as one’s own. We hope that Phoenix Petroleum will benefit from this access to the secondary market, and like many members of our Issuer Community, return to the public debt market for its future short term or long term capital requirements,” continued Mr. Crisol.